No. 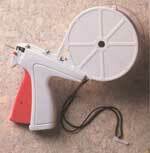 10636 Mark III" Long Needle Pistol Tool The extra long stroke and needle are designed for tagging bulky merchandise. The original tag attaching tool is comfortable and easily actuated. Operators say the Scissor-grip design feels most comfortable for tagging hanging goods. Designed to meet the tagging needs of the horticultural industry. Special materials resist corrosion and a drain hole allows for repeated cleanings. The Fine Fabric system is always the one to use when tagging delicate items such as undergarments and other fine fabrics. Designed with a fine needle to greatly reduce the likelihood of holes and snags. 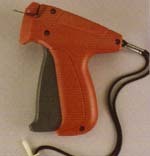 System 1000's pistol-grip design and built-in tag rest let the operator hold a ticket in place while moving the needle to the garment for easy one-handed tagging of either flat or hanging goods. The System 10000 hand tool features a special mechanism that prevents gun jams. For industrial applications, air powered System 1000 units are available.